Browse: Home / Bluto v1.99 – DNS Recon | Brute Forcer | DNS Zone Transfer | DNS Wild Card Checks | DNS Wild Card Brute Forcer | Email Enumeration | Staff Enumeration | Compromised Account Enumeration. + Email Hunter API Support Added. + Haveibeenpwned API Support Added. + HTML Evidence Report Added. The target domain is queried for MX and NS records. Sub-domains are passively gathered via NetCraft. The target domain NS records are each queried for potential Zone Transfers. If none of them gives up their spinach, Bluto will attempt to identify if SubDomain Wild Cards are being used. If they are not Bluto will brute force subdomains using parallel sub processing on the top 20000 of the ‘The Alexa Top 1 Million subdomains’ If Wild Cards are in place, Bluto will still Brute Force SubDomains but using a different technique which takes roughly 4 x longer. NetCraft results are then presented individually and are then compared to the brute force results, any duplications are removed and particularly interesting results are highlighted. Bluto now does email address enumeration based on the target domain, currently using Bing and Google search engines plus gathering data from the Email Hunter service and LinkedIn. https://haveibeenpwned.com/ is then used to identify if any email addresses have been compromised. Previously Bluto produced a ‘Evidence Report’ on the screen, this has now been moved off screen and into an HTML report. Search engine queries are configured in such a way to use a random User Agent: on each request and does a country look up to select the fastest Google server in relation to your egress address. Each request closes the connection in an attempt to further avoid captchas, however exsesive lookups will result in captchas (Bluto will warn you if any are identified). Bluto requires various other dependencies. So to make things as easy as possible, pip is used for the installation. This does mean you will need to have pip installed prior to attempting the Bluto install. 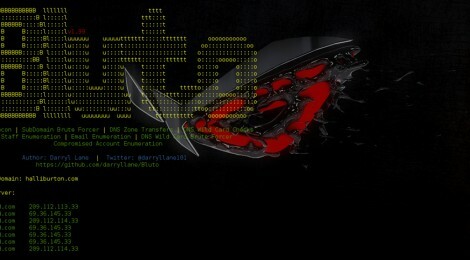 ← Commix v1.1 – Automatic All-in-One OS Command Injection and Exploitation Tool.